I came across this recipe looking around on, Chocolate and Zucchini, a site I’ve used before. It sounded good at the time, but when I went to prepare it, it seemed a bit too spartan. I had already planned on adding chicken, but need some veggies. We had some green beans in the fridge, so I threw those in. We also didn’t have shallots, sesame oil, or sake, so I ended up doing a lot of improv on this one. The idea was a nice start though and the meal ended up being really good. 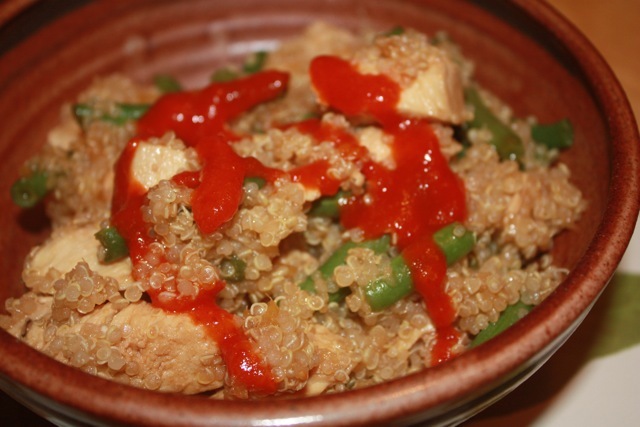 This recipe takes only about the 20 minutes or so that it takes to cook the quinoa. It could also be made with tofu for a veggie option. Cook the quinoa according to the package. Slice the chicken breasts into bite-sized pieces. Heat the oil in pan over medium high heat, and saute the chicken until cooked through and starting to brown (~5 min). Add the ginger and cook a couple more minutes. Add the green beans, soy sauce, 2 Tbs rice vinegar and brown sugar. Cook until the green beans are the desired tenderness, adding a little more vinegar if needed to keep things from drying out. 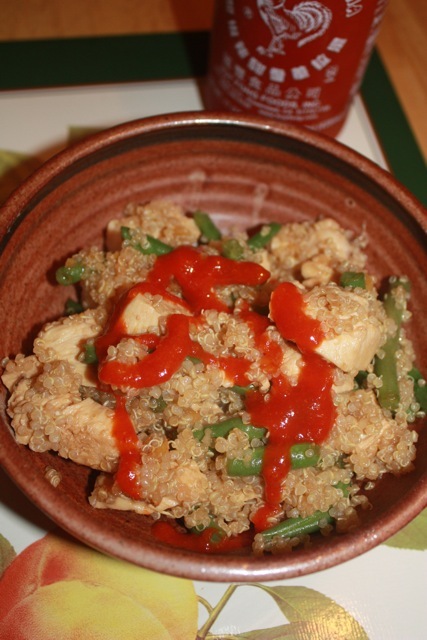 Mix in the cooked quinoa and serve with sriracha pepper sauce.